We finally left Bangkok yesterday evening. After bidding farewell to Am and Stef, who have kindly put us up, it was time to make tracks again. We decided to take a sleeper train for the eight hour journey down south, to Chumphon. This is where we'd get the boat to Koh Tao island from. Boat services run frequently and also connect to Koh Pang Ngan and Koh Samui, our next destinations after Koh Tao. The bunk beds on the sleeper train were comfortable. Even though it was a communal arrangement, once the curtains had been drawn, it offered some privacy. I read a few chapters of The Beach (this is the second time I've read this book and it seems apt now that we are visiting the Thai islands) before settling down to catch some shut-eye. I managed to sleep for seven hours but Ian only managed a couple of hours. He doesn't seem to have much luck sleeping on public transport and looked like he'd been poked in both eyes by the time we'd arrived at our destination. I think he was subconsciously anxious about waking up in case we missed our stop, even though the alarm had already been set for 4am. After the train, bus, boat and minibus journeys, we eventually arrived at the Big Blue Resort at 10.30am. 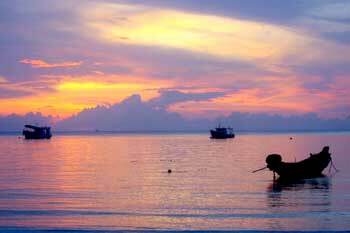 Koh Tao is well known for its excellent diving location and this is mainly why we've included it in our itinerary. Even though Ian had been looking forward to diving here, he felt too exhausted to give it a go straight away. Instead, we did a spot of snorkelling. We were taken out on a boat to White Rock, followed by The Twin Peaks just ten minutes from our resort. The water was lovely and warm and the sea calm - almost ideal conditions if only the visibility in the water was better. Still, it had been a while since we had used our snorkelling gear (the last time was probably in Clovelly in Sydney back in March) and we were just happy to get into the water. 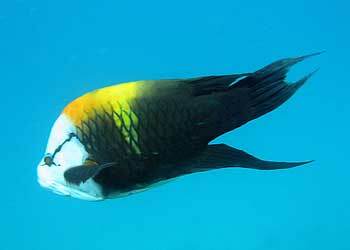 An as-yet-unidentified fish in Koh Tao's waters. The second spot, The Twin Peaks, was better than the first - from a snorkelling perspective. This is because the coral reefs are closer to the water's surface. We saw some amazing fish and even a large jellyfish that was probably the size of a football. We were careful to swim around it, avoiding its tendrils. We also spotted some clams, sea snakes and sea cucumbers in amongst an array of fish. 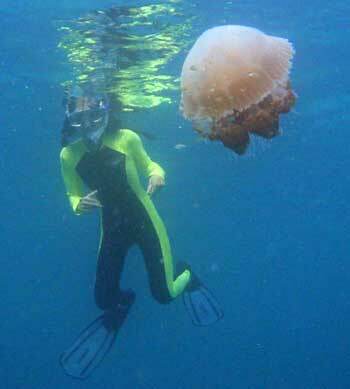 Manda keeps a close eye on the football-sized jellyfish. Some of the divers spotted a turtle and some stingrays too. We didn't see these but we did, however, spot a trigger fish. And boy can these small fish do some damage. On our last trip to the Great Barrier Reef, one of the cooks (on a live-aboard dive boat) got a nasty cut above his eyebrow as a result of swimming too near to this type of fish. Apparently they are more aggressive around mating season but that's not now, thankfully. At least now that we've gotten some of the potentially troublesome marine life out of the way, maybe from here on in we can get to see only the colourful and cheerful ones - like the goodies from Finding Nemo.